Following his previous looks, Chadwick Boseman's stylist Ashley Weston posted to her instagram another winning look from his hosting duties on Saturday Night Live(April 7th). 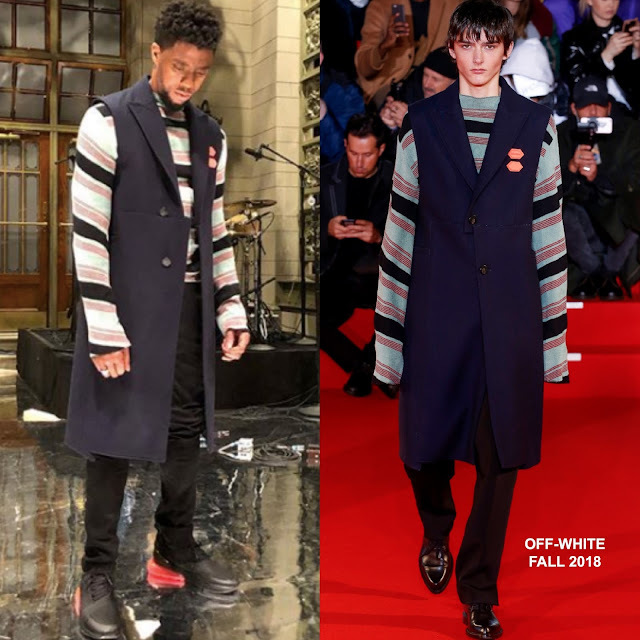 For this look, he turned to OFF-WHITE, wearing a FALL 2018 sleeveless navy overcoat with a stripe knit top underneath and black split hem trousers. Opting not to wearing dress shoes, he went with black & red heel NIKE sneakers which up'd the cool appeal of his look. Love this look from head to toe, it's another win for me.